This book contains two advanced expositions on the development of higher insight knowledge by the renowned Burmese scholar monk and meditation master Ledi Sayadaw. Topics dealt with include Dependent Origination, Kamma, Causality, and Nibbana. 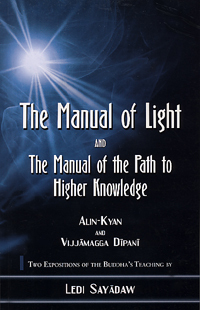 The Manual of the Path of Higher Knowledge (Vijjāmagga Dīpanī) has never been published as an English translation, while The Manual of Light (Alin-Kyan) has not been published in its entirety until now.